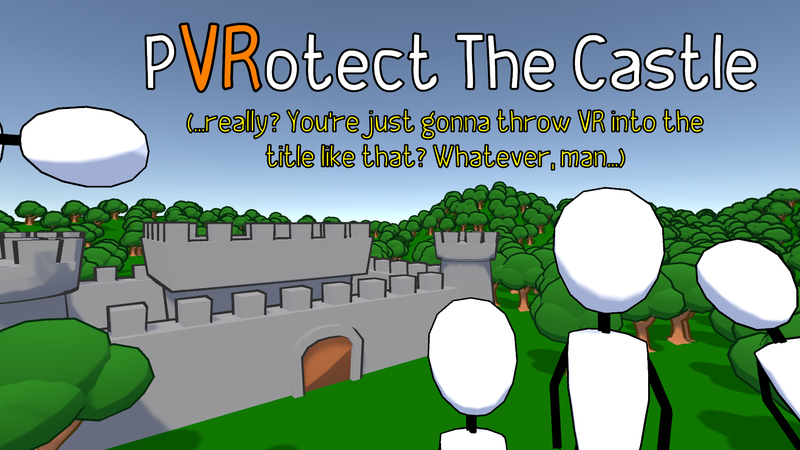 PVRotect the Castle is a VR game (I mean, c'mon, you totally already knew that because I put "VR" in the title) that lets you protect a castle (I mean, c'mon, you totally already knew that because I put "Protect the Castle" in the title). Fight off waves (wait, a wave-based VR game?.. totally haven't seen that before, amirite?) of little stick dudes and stop 'em from messing up your sweet castle. Just, like, reach down and grab stuff. Use the triggers to squeeze your lil' VR fingers. Squish the enemies in your preferred manner. If you aren't one of those lucky dudes who has like a huge extra room to play VR in ( #firstWorldPVRoblems) and things get a little cramped, try rotating the play area from the main menu to see if that helps. In all seriousness, though, this game is just a lil' project I worked on in my free time. I have a lot more ideas for how I want to make it better, but not sure how much more time I wanna put into it (too many other projects going on), so this may (or may not?) be as finished as it gets. I encourage feedback though, because even if I don't fix it in this game, it might help me grow as a game developer. Anyway, I hope you enjoy! Props to Unity, Valve, Blender, and the folks who work on VRTK for making awesome tools to make stuff like this possible for a guy to make in his living room. I am a CS student working on a VR research project. I was wondering if you would allow me to mod your game/code for our project? This is not for any monetary gain, only research purposes. You will be given credit in any paper/presentation we do. You should add a coop mode where VR person plays as the picker and thrower and someone else could play as the people trying to charge the castle. Wouldn't that be considered a "versus" mode and not a "co-op" mode? It's a shame this hasn't been worked on more. It clearly has a lot of promise, but it's just rather empty. I would love to play a full game this way. The ragdoll is such a fun time! Just played the game, it is actually awesome! Really wish you would add to it. Has tons of potential. Do you mind if I record it for my youtube? Thanks! If I get some more time/inspiration, I may come back to it. And of course, feel free to record it. And post a link to your video in the comments if you fell like it. I'd love to see other people playing it! love the game can you add new figures with things? This is a really solid game, thanks for sharing it! Is there any way to get access to the model you used for the stick figures men? Thanks for checking it out! I made the model myself using Blender. I don't currently have plans to upload it for public download. I encourage you to learn a 3D modelling tool (like Blender) if 3D models are something you are interested in. The stick figure was actually pretty simple to make, so you could probably make one of your own (or perhaps an ever better one) pretty easily if you really wanted. Okay. Other than just searching through YouTube for tutorials, do you recommend any resources.. right now I'm trying to learn about rigging and creating interesting animation states / blending through them via script.. so I'm trying to find or build a really easy and clean model to practice with. Your stick figures were spot on so I was trying to save the model craft step.. that said, I should learn blender at least on some basic level and this would be a good way to.